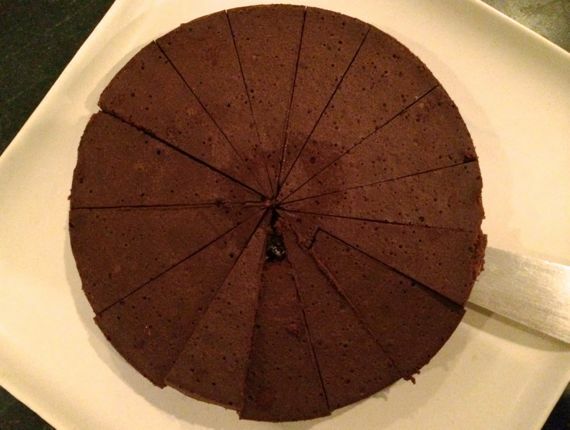 My Book Club became universally quiet except for moaning sounds when we received our slices of this yummy rich cake. For best results, make this cake the day before you serve it, and chill overnight in the pan. First, remove eggs and butter from refrigeration about 30 minutes before beginning, to allow them time to come to room temperature. Preheat oven to 300°F. Makes one 10-inch round cake. Slice this cake smaller than you might normally divide it. Grease a 10-inch round cake pan and set aside. A springform pan is the best choice. If it is a springform pan, wrap the outside with foil to seal the pan/batter (from the water bath water). Find a pan to use for a water bath for this pan/cake. Heat water to be ready when you put the cake in the oven. Heat the water, salt, and sugar in a small saucepan until completely dissolved and set aside. Alternatively, carefully use a microwave. Using a microwave (low power) or double boiler, melt the chocolate. Make sure the heat is only sufficient to melt the chocolate. Pour the chocolate into your mixing bowl. Cut the butter into pieces and add the pieces one at a time into the chocolate. Next, add the warm sugar-water, beating until mixed. Slowly beat in the eggs, one at a time. Pour the batter into the greased cake pan. Make sure that it has a foil wrapping underneath to seal the pan if it is a springform variety. Add the hot water carefully around the cake pan. Bake at 300°F for 45 minutes. The center of the cake will still look wet. Chill overnight in the pan. To unmold, dip the bottom of the cake pan (still in foil) in hot water for 10 seconds, then invert onto the serving platter. Optional raspberry sauce: heat 1 cup berries, 1/cup water, and 1/2 cup sugar (less if berries are quite sweet) in a saucepan until blended. Strain to remove seeds and set aside to cool. Other fruits could be selected and treated similarly.